A new report released this week and endorsed by over 50 organizations around the world reveals that 36 of the world’s biggest banks funneled $115 billion into fossil fuels in 2017, an 11% increase over 2016 levels despite it being the costliest year on record for weather disasters. The report, Banking on Climate Change 2018, is the ninth annual report ranking bank extreme fossil fuel policies and practices, published by Rainforest Action Network, BankTrack, Indigenous Environmental Network, Oil Change International, Sierra Club, Honor The Earth, and endorsed by over 50 organizations around the world. The report assessed 36 private banks from Australia, Canada, China, Europe, Japan, and the United States (and policies from additional banks and Singapore) and grades the banks on a report card across six specific sectors — tar sands, arctic oil, ultra-deepwater oil, LNG exports, coal mining, and coal power. And looking at the grades available here, it is not a pretty picture. The high-level findings from the report reveal that the 36 banks analyzed funneled $115 billion into extreme fossil fuels in 2017, an increase of 11% over 2016’s figures. 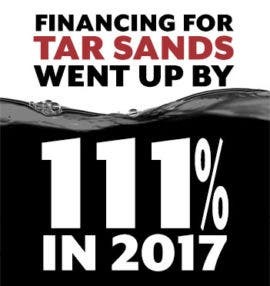 Leading this increase in financing came in the tar sands sector, where financing grew by an obscene 111% between 2016 to 2017, resulting in nearly $47 billion fed towards tar sands support, and overtaking coal power as the most heavily funded extreme energy sector. The only upside when you look through the report card is the work being done by some European banks, realizing the risks and implementing policy restrictions on some of their fossil fuel financing. Conversely, however, North American banks were found to be turning their back on the Paris Climate Agreement and doubling down on fossil fuel investments. Specifically, Royal Bank of Canada, Toronto Dominion Bank, and JPMorgan Chase each passed the coal-heavy Chinese banks to become the biggest bankers of extreme fossil fuels in 2017. 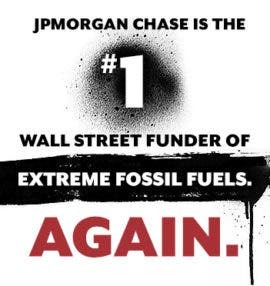 JPMorgan Chase, for example, increased funding to coal mining by a distressing 21 times and quadrupled its tar sands oil financing. But it is important to note that the work done by European banks is not enough. “Despite the introduction of some restrictions in their coal financing policies over the last few years, the 14 European banks assessed in the Report Card managed in 2017 to collectively increase their financing by more than $2 billion for companies in the coal mining and coal power sectors,” explained Johan Frijns, Director of BankTrack.